I've just checked the battlegraph which confirms that Euryalus was a wire-crushing tank and ditched on the third objective on November 20. This would tie in with the final location of Euryalus beside Ravine Alley, as shown in post #8 (and various other photos during and after the war). The IWM gives the following caption for the tank in post #1: "A disabled tank of the 2nd Tank Brigade (6th Division) utilised as an observation and signalling post near Ribecourt, 23 November 1917". This suggests the WC tank was in its final resting-place, which certainly doesn't look like the place where Euryalus ended up. Perhaps they weren't the same tank after all. 2nd Tank Brigade was formed of B and H Bns (E Bn was in 1st Tank Bde). B Bn were on the right and their objective was Marcoing, H Bn were on the left and their objective was Nine Wood (Bois des Neuf) which is north of Marcoing. Ribecourt was within H Bn's boundaries. My gut feeling is that the IWM may well be correct. Did H Bn have WC tanks? Thank you John for you good words. That gives me the chance to dive into that topic. Of course our book “Following The Tanks” is an old book which needs some correction (sorry nobody is perfect!) but the main substance is not too bad. The years and experience have allowed us to go farther in the identification of the series of tanks abandoned on the Flesquieres ridge, my favorite sector. The study of a good number of German photos and British official documents, has allowed me to do so. I am now absolutely convinced that 3 tanks were destroyed in that very precise spot. The well known “WC” (The only one I know with that painting but no doubt, it wasn’t unique). The film and the well know photo with the observers were done during the Battle of Cambrai time and shows “EURYALUS WC”. After the 21st of March 1918 the Germans recaptured the position including the wrecks of this 3 tanks, all next to the others. More photos were done including these in #8. The wrecks of these tanks were still there when at least the village was liberated. This was in September 1918. There are other photos done in 1919 (!) which shows the same groups of tanks before they were moved by the salvage Company of the Tank Corps. No one of these tanks were recovered before. Their conditions and positions have just change because they have suffered other shells damage inspite there were dead tanks. The neighbourgh tank of EURYALUS was incorrectly identified in “Following the Tanks” (my fault but I was young!)) as EGYPT II. In fact it was EDINBURGH II. The correctionwill be in the updated version of our book which is actually in the workshop. Cher Philippe, ce est merveilleux d'entendre que vous entendez sur la GWF. How marvellous to see you here on the forum. Please do keep us up to date about the updated version of Following the Tanks and when it is available. I would like to add it the my original copy which you signed for me. Good to hear from you on the Forum Philippe. The conclusion then is that the photos in posts #1 and #8 all show the same tank. Fantastique!! Except that, this doesn't solve the problem of the starboard track being broken in a different place (see my post #23). I assume that this track was repaired and the tank moved from the position it occupied when filmed and was knocked out, and the starboard track broken again, in its final resting place. Gwyn and Gareth were a bit suspicious about the comparison of position of the 2 “WC s”: the IWM (posted by Tom # 9) and the one on the German photo marqued “EURAYALUS” because of the ground’s shape and also the tracks damage. There were right. Since years, I was convinced that both were in fact the same tank. 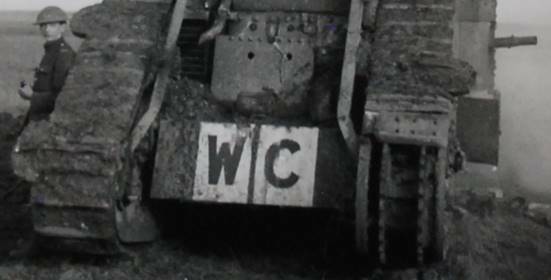 However, following an internal exchange, John has showed me the evidence that the “WC” tank of the IWM film is NOT the “EURAYALUS WC”. This was made possible because of John sharp’s eye and a need to study of every little detail. 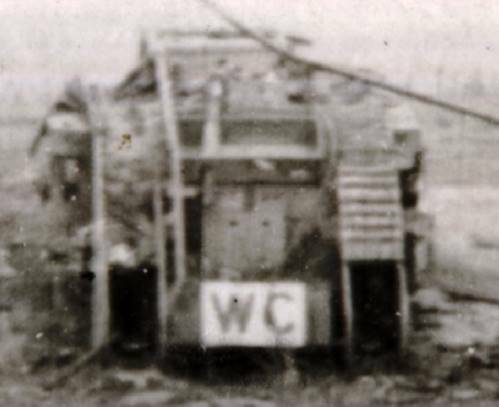 John writes : “I’m now convinced the ‘WC’ tank in the Imperial War Museum picture is not Euryalus. The evidence is in the letters on the back of the tank. I apology have been so affirmative but thanks to John, true is established. In conclusion there are a minimum of 2 WC tanks which were filmed/photographied. For EURAYALUS the localisation mission is done. Next challenge will be to identify position of he IWM film “WC” and its identification. Truth will out! Thank you very much Philippe - now I have to correct my records too... I had not seen a photo of the rear of 'Euryalus' so could not have noticed the difference in the marking of 'WC' so I am also grateful to John. I only wanted to know what WC stood for..!!!! Seriously though chaps, excellent team work from all concerned, you are to be congratulated. Well done!! This is an old thread, but a little piece of further information about Euryalus. The IWM Photographic Collection includes the collection of Brigadier General J. G. Geddes. The photos are said to include "destroyed British tanks (B23, Euryalus)". (Obviously these must be two different tanks, hence the plural in the description). The photos are held as negatives only and have not been digitised. That's very interesting Gwyn - I see from the catalogue that these are copies of German official photographs, so presumably include photos of Euryalus and the group of E Bn tanks to the east of Flesquieres, which were photographed many times by both the Germans and British. However I have learned one should never presume anything! It would be well worth taking a look to see what these negatives contain. Will add them to my list next time I'm at IWM. I'm intending visiting myself the week after next, but my list of things to see is already long and these items won't contribute to my research interests. Let us know if you find anything else of interest!